South Africa’s gorgeous Kosi Bay is part of the iSimangaliso Wetland Park, a Unesco World Heritage Site that stretches 200 km along the Indian Ocean coastline. Kosi Bay is located in the remote northern reaches of the park near the Mozambique border. A great way to see the splendors of Kosi Bay’s deserted beaches, lakes, and coastal forests is via a guided, 3-day slackpacking hike—all meals are provided, and luggage is transported between lodges. We had an awesome time on our hike with local guides Agripa and Enoch who expertly led us along beaches, a crazy network of footpaths, and a few shallow water crossings. The Kosi Bay Trail is not difficult, but it is also not well defined, nor is it signed. Without guides, we would have got hopelessly lost. 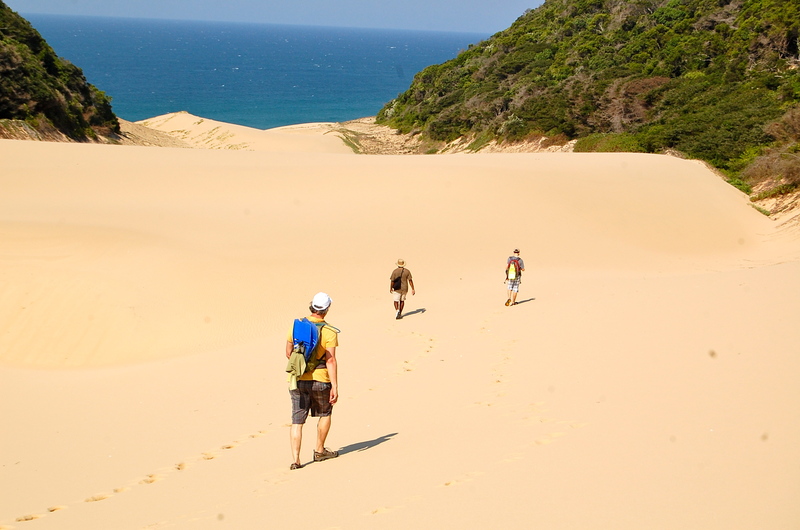 The trail travels along some of South Africa’s most beautiful beaches with endless stretches of pristine sand. We saw more dolphins and whales than humans on this gloriously remote coastline. Depending on the season, you can also see nesting loggerhead and leatherback turtles. One of our favourite activities was snorkeling at Kosi Bay’s estuary mouth, nicknamed “the aquarium”. The calm, shallow water is filled with colourful reef fish and an amazing number of morays. Just inland is a string of four lakes, connected by narrow, mangrove lined channels. The lakes are home to hundreds of bird species, as well as hippos and crocs. The hike includes a boat tour through the lakes where we got a close up view of the fish kraals—traditional fish traps that have been used by the local Tonga fisherman for over 300 years. My guys looking less than amused on the last stretch of the Kosi Bay Trail, South Africa. Between beach and lakes, the hike meanders through a diverse mixture of open savannah and forests thick with fig and raffia-palm. Monstrous sand dunes provide the most incredible views and fun descents to the Indian Ocean. At the end of our active days it was great to have delicious home cooked meals and comfy beds. Our itinerary included 2 nights each at Memela Bush Lodge and Utshwayelo Lodge and Camp with luggage transported between the two. The lodges are rustic, but clean and comfortable, and wonderfully atmospheric. We especially enjoyed our thatched, open-air (only three walls) bungalow at Memela. Both places are operated by wonderful folks. Kosi Bay is remote and takes a bit of effort, but it’s totally worth it for nature lovers seeking an unspoiled paradise. The park’s name, iSimangaliso, says it best: it’s a place of miracles. Our hike was organized by Active Escapes, a South African adventure travel company. Active Escapes took care of all the details—planning the itinerary, booking the lodges and guides, and providing pre-trip information. The closest major city is Durban, about a 5 hour drive. From Johannesburg, it is an 8 hour drive. The roads to Kosi Bay are generally good and well marked. A regular vehicle will easily get you to Utshwayelo Lodge. Provided you’re moderately fit, the Kosi Bay Trail is not a difficult hike. Daily distances range from 12-17 km, the terrain is mostly flat, and you only carry a day pack. The dry winter months (June-August) are a great time for hiking with daytime highs in the low 20s C, and nights no colder than 11 C. The water is a bit chilly, but we still enjoyed the snorkeling. If you’re planning a trip to South Africa, Kosi Bay makes a great addition to visiting one of the fabulous game parks like Kruger or Hluhluwe-iMfolozi.